The SNP membership see the vast challenges in front of them. Nicola Sturgeon addressing SNP conference - Peter Murrell. 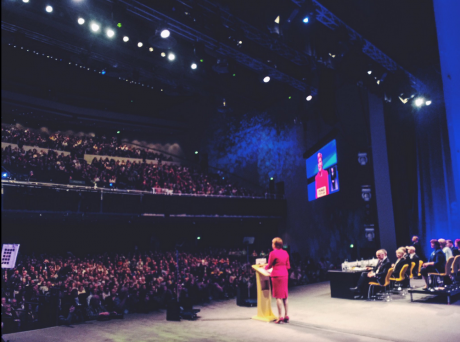 The SNP’s rise to become Britain’s third party – in parliamentary seats and mass membership – has corresponded with its annual conference adopting the importance, scale and feel of one of the two UK big parties. It is self-evident that Nicola Sturgeon as leader, and the leadership of the party in general, are trusted by the party’s grassroots to make the right calls and judgements navigating the wreckage of Brexit and deciding the timing of indyref2. It goes without saying that Nicola Sturgeon is enormously popular with party members, but that doesn’t mean there aren’t shades of doubt. Beyond public pronouncements and debates at conference, party members talked openly about the difficult choices on independence post-Brexit, framing and winning indyref2, and at the same time, governing and attempting to protect public services while having a coherent legislative programme. Nicola Sturgeon has been careful and considered in her statements – on Brexit and indyref2 – doing so to such an extent that some can misconstrue her seriousness and steel. One example being Jason Cowley, editor of the ‘New Statesman’, mistaking Sturgeon’s tone on the BBC ‘Marr’ Show for meaning that ‘she clearly doesn’t want indyref2’. Less than one hour later on ITV’s ‘Peston’, Sturgeon confirmed that it was ‘highly likely’ that indyref2 would take place before 2020. But there are tensions in the party which isn’t surprising given the stakes. Newly elected depute leader Angus Robertson ruffled some feathers when he said to CommonSpace that ‘ideology’ should have no part in the winning of independence. That did seem to be taking John Swinney’s ‘centre ground’ strategy to ridiculous levels and begged many questions. Sturgeon’s keynote speech on Saturday was a daring one for her – and any Scottish or British party leader. It was, while light on policy, powerful written in its outlook, and contained passages it would have been unimaginable for Alex Salmond to have uttered. Large sections of her speech were shaped by an emotional literacy about policies, politics and society, which was audacious. To talk of the importance of love in terms of the oft-mistitled ‘care industry’ was moving to those in the hall, and clearly Sturgeon herself, but carried a wider message about the higher purpose of what politics and government is meant to be about, of which the symbolism of the Baby Boxes was but one part. The most important passages came when she said that there is much more which ‘unites us as a country than will ever divide us’ and explicitly challenged the political divisions of recent years and referendums. In particular, there was a daring quality to admitting that not only do No voters have feelings and emotions, but their sense of being threatened by independence had to be recognised. This may seem obvious to those of the non-independence persuasion, but it was all the more powerful for it, if a bit belated coming over two years after the indyref. I have consistently argued that independence doesn’t win by its most partisan zealots berating, hectoring and questioning the motives of No voters in 2014. Such an approach is even evident in the ‘Are You Yes Yet?’ as if No voters are expected to recant for their sins and responsibly for every supposed crime committed by those evil Tories. It is still not clear how the SNP will reframe and recalibrate the politics of independence, but this is an important first step. It has to in tone and content be consistently held to and inform a different kind of strategy and offer. This will be one which is empathising of No voters in the past and now, and has an honesty, humbleness and humanity, rather than populist, challenging and sometimes cantankerous qualities of 2014. SNP members and activists are aware that lots of work needs to be done. They are aware that with success and dominance comes the problems of expectation, discipline and proper opposition and scrutiny. They recognise that nine years into the SNP in office they have often escaped from much rigorous opposition or proper scrutiny, and eventually, that this comes back and hurts the SNP. There are even in places soft anxieties about the cumulative effect of too much centralisation and scooping up powers into the hands of Scottish government ministers. And there is a growing awareness that the relationship between the party and wider movement, often alluded and referred to by the leadership, has to become more than just tokenistic, where the latter are only trawled out for a tokenistic reference point. Instead, as we come up for a decade of Nationalist Scotland, there is a widespread feeling that both independence and wider policies need a richer hinterland than just ministers and special advisers, with once or twice yearly party debates the only other input. The question of pro-independence independent resources, whether it is the absence of a conventional think tank and other research institutes, has become more widely talked about. That is at least some sort of progress, but action is urgently needed, particularly if any indyref2 is merely a couple of years away. The Scotland of 2016 is a very different country from that of only two or three years ago. But nothing lasts forever and no political mood or party dominance goes on into the future. Scotland has gone through huge waves of change: politically, economically, socially and culturally in recent decades and that isn’t going to stop. One SNP member reflected at a fringe that: ‘Labour’s 1979 referendum shafted the SNP, whereas the SNP’s 2014 referendum shafted Labour’, touching on some of what has happened has been unexpected and unpredicted, and that this might be the same for the future. There was an awareness of that around SNP conference and an understanding that the party leadership has a window of opportunity to flesh out a strategy an approach to independence and the future politics of Scotland. In all likelihood, some of this will disappoint some of the more left-wing elements in the SNP and beyond. Already the talk of ‘Red Nicola’ (which was always ridiculous) has gone away, but others have shown disillusionment that independence will be presented as ‘a new normal’, as Theresa May and her Brexiteer government burn down the house in pursuit of a xenophobic, insular nationalism. This latter phenomenon is both an opportunity and threat to the SNP and cause of independence. A second indyref is even more of a high wire risk for the SNP than first time, because until the very end of the first campaign, few expected Yes to win. Next time, assuming there is a next time, independence will be the favourite to win, and that changes everything: the nature of the offer, scrutiny and debate of it, and how the British state and No voters respond and react. No doubt some of this future will involve the same or even more noise and hysteria than 2014, but in places, it requires a politics of mutual respect, of the kind articulated by Sturgeon on Saturday. For if Scotland has a more than even chance of becoming independent in the next few years, it has to happen by not insulting half the voters as our equivalent of ‘deplorables’. Instead, we have to win by acting now with the decency, humility and honesty, as if we were already independent today. There are numerous convulsions ahead. There is the role the Scottish Parliament has in any Brexit negotiations – which might not constitute a ‘veto’ but involves the prospect of a legislative consent or Sewel motion. Is it really possible that Brexit’s clarion call of ‘Taking Back Control’ is really going to end up with the empty theatre of the Great Repeal Bill, lots of UK executive diktat, and the Scottish and other devolved parliaments and assemblies being marginalised? Maybe such is the reality of British parliamentary sovereignty. What happens if the UK negotiates a soft Brexit that respects Scotland’s interests? Angus Robertson says it would mean ‘we would not go ahead with a referendum’. Then there is what happens to the powers coming back from the EU to the UK which will mean enhanced powers for the Scottish Parliament on agriculture, fisheries and the environment: devo max Brexit or devoexit. Perhaps most critically, if a hard Brexit emerges there is the question of what the nature of the UK/rUK will be across these isles – which extends far beyond the media and political elite obsession with the single market. From this stems the huge democratic question, of whether Theresa May, if push comes to shove, would grant the Section 30 order of the Scotland Act 1998 (as David Cameron did in 2012) to allow a binding second referendum. At the moment, we have no signs either way on May’s intent, but to refuse Scotland’s claim would be an act of constitutional vandalism and one which in effect ripped up the ‘equal partnership’ of the UK. That would give the cause of Scottish independence (as in Catalonia) the democratic mantle, and provide a bumpy, but surely inevitable road to eventual independence. These are dramatic and historic times, and Nicola Sturgeon’s step-by-step diplomacy is sensible, but the SNP are going to need to find new allies and aid a deeper culture of pluralism and debate if they are to convincingly win indyref2: and that will require multi-tasking of the highest order. The SNP have travelled far and taken Scotland far, but some of the biggest challenges yet await it.